We have been dealing with this disease from several different angles. All of which we believe complement each other and when combined have had a powerful effect on Jacob. It is our belief that this combined approach is key to what we are doing. This is Jacob with Dr Perlman who is an Holistic Chiropractor. He has done some amazing stuff with Jacob and is helping him to walk again! Jacob has treatment with Dr Perlman once a month, as well as Dr P prescribing certain supplements etc. Dr Perlman is a Dr of Chiropractic, Naturopathy, Homeopathy, Herbalist, Iridologist and Ayurvedic Practitioner. He is well known in this industry and, dare I say, performs miracles! I have referred a few of the kids at Jacob's school to him and whatever and however he does it he makes a total difference to their lives! Jacob has improved so much since seeing Dr P with his walking, concentration and constipation and all over well being. He is one of a kind and I would highly recommend him to anyone. Please email me if you would like any more info on him... as he is quite hard to explain! This is Penny who has taken over from David healing as he has moved to Cornwall... Penny is very similar to David in that she does healing but also she does Thai massage/stone therapy/chakra work/Yoga and reflexology as well. She sees Jacob once a month and decides, pretty much when she gets here, what Jacob needs, in fact Jacob was having healing once a week... then once every other week... and now once a month! - as he is doing so well. David and Julie however still keep in touch and try to come down as much as they can, and when they do they always pop in and do some healing with Jake. As soon as we found out what Jacob had I contacted a friend of mine Nene who does 'Reiki' a form of spiritual healing, and Jacob started having healing straight away. Nene recommended that Jacob saw her teacher and friend David Hand as David has been doing healing for many years. So called David and by the end of Oct Jacob starting seeing David weekly. David comes to the house every week for approx 1 1/2 hrs and 'heals' Jacob. As you can see in the picture (we have a pic of david doing the healing) David dowses Jacob to check that his chakras are open and then begins his healing. The easiest way to explain what healing is and does is that it compliments conventional medicine or in Jacobs case the stem cell treatment, by channelling life energy to the patient in order to help them recover from illness, injury, stress, emotional issues etc. Healing is now beginning to be recognised in the West but in the East it has been acknowledged for 1,000's of years. It is life force energy. The Chakras are the energy centres in the body which are the openings for life energy to flow into and out of our aura. We all have 7 Chakras which relate to different things. The healing we believe has been a crucial part in Jacob's recovery and will continue to do so as long as Jacob needs it. David also came to the house with his group and 'cleansed' our house, and we have now filled our house with a range of crystals to keep positive and healing energy flowing through the house and also ourselves. Jacob absolutely loves his healing with David and David has become a very close friend and councillor who has helped us in so many ways get throught this very traumatic time. We couldn't and wouldn't be without him. Or his wife Julie... who has also played a big part in Jacob's recovery. Julie is a qualified Yoga teacher and David, after a few months, pulled her in to help rehabilitate Jacob and help him with his breathing, balance and posture. Yoga is a healing system of theory and practice. It is a combination of breathing exercises, physical posture and meditation that has been practised for over 5,000 years. The breathing helps Jacob relax and also helps with his speech... it is like learning to breathe again properly.. so therefore speaking clearer, and the different exercises Julie does helps Jacob with his balance, co-ordination and posture, re-training the brain. The healing and the Yoga works hand in hand with each other... by Mr and Mrs Hand!! We did notice that after a few months of Yoga before the stem cell treatment Jacob's posture/balance and co-ordination started showing signs of improvement. We also believe that the Yoga and the healing got Jacobs mind/body and soul ready for when he had the stem cell treatment. As you can see in the picture... one of the exercises Julie does with Jacob. 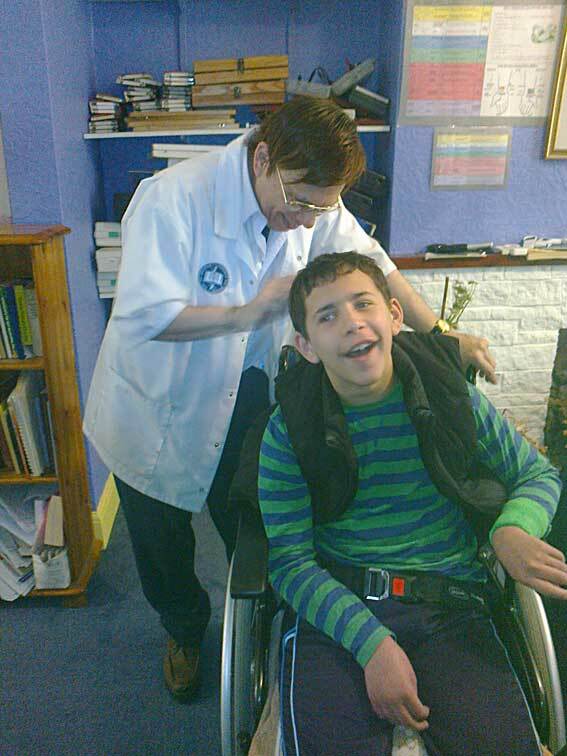 Julie usually spends 30-45 mins with Jacob and its another great form of physiotherapy. Like David, Julie has become a great friend and teacher and works fantastically with Jacob. So Jacob does his Yoga first to relax and revitilise himself and also to open up his chakras for David to do his 'stuff'!. If you would like to find out more about David and Julie please visit their website www.mysticklight.com. This is another form of healing that Jacob has. Linda Kinsella has been doing Radionic treatment with Jacob since January. Radionic is a method of sending precisely defined healing energy to people. Similar to what David does - but the beauty with this is that Linda can heal you where ever you are - all she need is a lock of hair. Linda has special electronic equipment... as you can see in the picture... this piece of equipment tells her what's wrong and what to do... all by his hair... it is amazing... I can tell you that when Linda set it up at the beginning she told us all about Jacob and what was going on and even trauma/operations he has had in the past, she picked exact dates of when he has operations and when he was suffering with grief after losing his Grandma and Grandad. It was like that lock of hair she took told Linda Jacob's life history! Radionic heals in all different ways from past trauma/weeknesses/disease/emotional problems etc. Linda is always spot on with her assessment and every week we email each other with updates. She will email me and ask if Jacob has a cold.. I say no don't think so... 2 days later... Jacob has a cold... it really is impressive. For more info on this form of treatment you can either email Linda - linda@innerbalance.plus.com or look at www.radionic.co.uk This form of healing isn't the easiest to explain - but believe us, it works! There are many different types of crystals you can buy for use in a whole range of things. We discovered a crystal called Orgonite which we dotted around the house. We actually have orgonite pyramids which act as a positive energy generator that produces a lovely vibration, that can help with sleep/stress/illness etc, turning negative energy into positive energy. You can read more about this crystal from Mix the chap we get them from www.orgoniterocks.com or take a look at Tribes & Vibes. We also have Amethyst, rose quartz dotted about which are good for healing and love, these also act as amplifiers around the house. Jacob loves crystals and has a load around his bed! Reading this you may think we are nuts! but faced with what we are face with you will try anything! from holistic to stem cell treatment! and it all seems to be having a huge effect on Jacob... If all this worked on people 1,000s of years ago why can't it work now!